I started by die-cutting my poppies from hot press watercolour paper. I watercoloured them with distress inks. I combined Mustard Seed with just a little Peacock Feathers to create the green for the stems. Then watercoloured the poppies, first with a layer of Mustard Seed with highlights of Spiced Marmalade. I used an orange w/c pencil to add a bit of definition to the blooms. The background is a dot stencil, randomly coloured with Peacock Feathers ink using a clarity brush. I love the softness the brush adds to the stenciling. Used a stylus and mat to shape the poppy blossoms and then adhered them over top of the stenciling, using pop dots behind some of the flowers to give them extra dimension. Stamped a sentiment in more Peacock Feathers ink to finish the card. I think these colours would make anyone smile. It feels like spring is not far away. :) Thanks for coming by for a visit! You definitely had to enter that challenge - your kind of colours for sure! 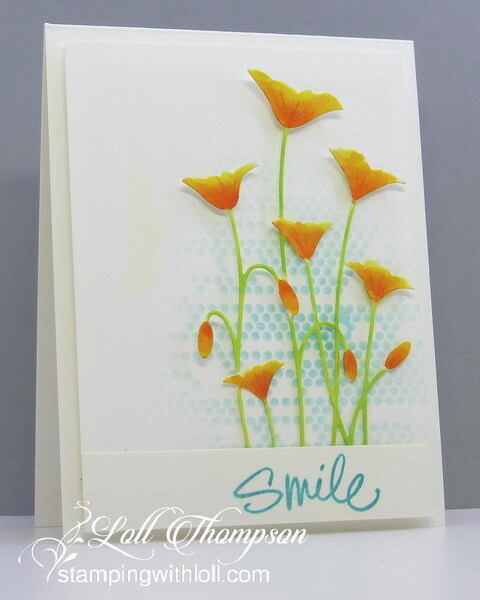 It's a beautiful card with the soft stenciling behind the poppies. I'd like to try watercolouring that die when we get together in February! Wow! What a beautiful card Loll. Love the stenciled background (checked to see how you used the clarity brush) and you have worked it perfectly. Your poppies look amazingly realistic with the tiny veins. Like how you added your sentiment to the bottom here. 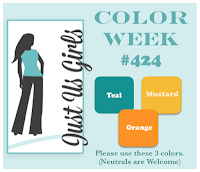 So glad you like my colour choice and you joined us at Just Us Girls. Thank You so much.... Of course I would love to see you here again real soon. A beautiful background Loll - I hardly own any stencils and must rectify that as soon as poss - lovely card. The poppy die is one of my faves. 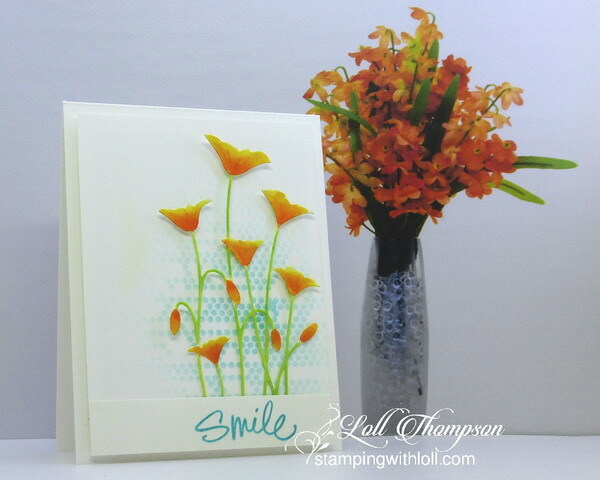 What a great stencil background for these lovely poppies. The colors are simply beautiful. What a fabulous job you did coloring your poppies. Gorgeous blending on those! I found it so hard to color a die cut with narrow parts like the stems. You succeeded beautifully and love how you created that cheerful green on the stems. Your background compliments the artwork so beautifully too. So very lovely with fab colours. Oh Loll, these are lovely! I love poppies. Reminds me of the fields of them that would grow in California. I have a framed photo of wildflowers with a poppy front and center to take me back whenever I need a pick me up. You've achieved the color beautifully. The background sure helps the flowers pop. As does your work to give them dimension. This card sure made me smile! Happy weekend! So pretty. I struggled with this colour combo. You did an amazing job with it. Love the soft stenciled background. What an inspiring card Loll - this is absolutely gorgeous! Love how you have used the colours, especially the blue behind the orange. Beautiful creation, the colors and layout are just perfect! Thanks for joining us at JUGS! The shaping adds so much to the look of your lovely flowers, Loll, and the polka dot background brought in the real color perfectly. I'm glad you shared your card with us at Just Us Girls. Your card is so pretty and fresh looking! It reminds me of Summer! A great color combination. I love how you used the gradation of colors for flowers. They look amazing. Stained by the stencil the background beautifully highlights the flowers.